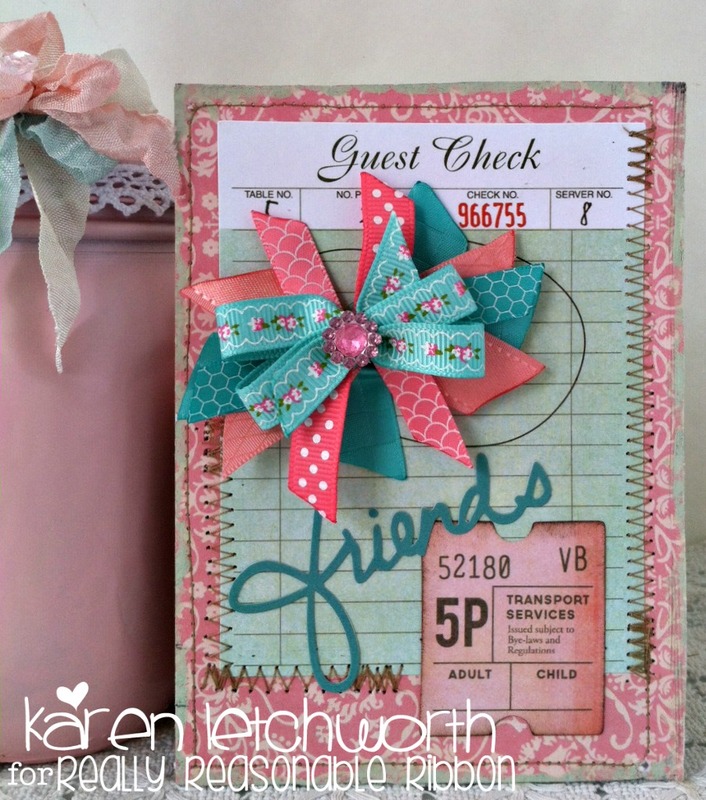 It's Karen Letchworth here today with something sweet! Most of you who know me already know how much I LOVE Really Reasonable Ribbon and all their AWESOME ribbons, laces, trims and more. Today, I wanted to create a card for a special friend, and I knew that Really Reasonable Ribbon would make my card super special. I started with a piece of floral patterned paper that I touched the edges of with paint, and then machine stitched. 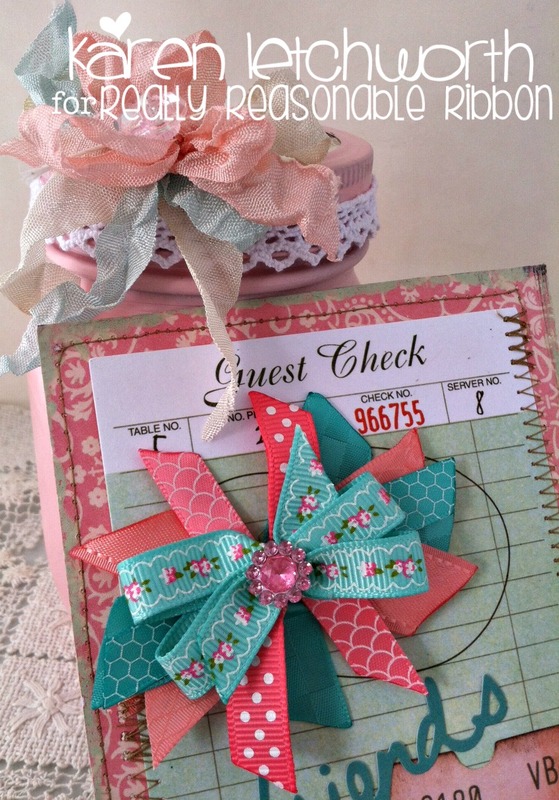 Next, I added some cute die-cuts, and topped them with a FABULOUS bow created with several lovely ribbons from.......you guessed it - Really Reasonable Ribbon! Finally, I want to mention the jar in my photos. I decorated it by taking a canning jar and spray painting it pink, and then I adorned the lid with more of Really Reasonable Ribbon's GREAT trims including their sweet Helen White Crochet Lace, Cream Seam Binding, Rose Petal Seam Binding and the luscious Bay Leaf Seam Binding (my personal favorite). But again, they ALL work together SO beautifully, and make your projects look fabulous! Why not treat yourself to some today? You deserve it, and you will absolutely LOVE everything you purchase. 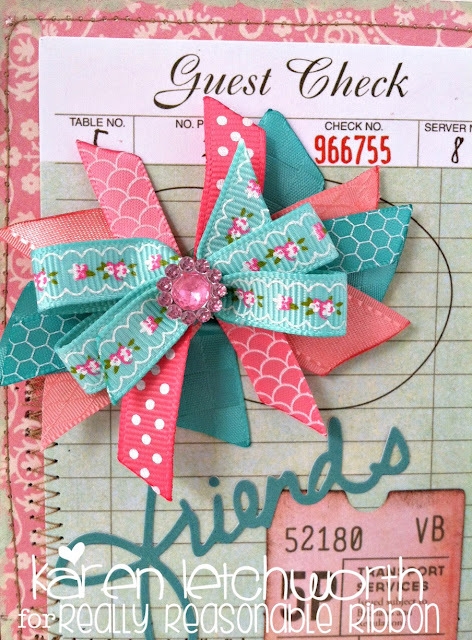 We really hope that you will play along in Really Reasonable Ribbon's FUN CHALLENGE going on now.